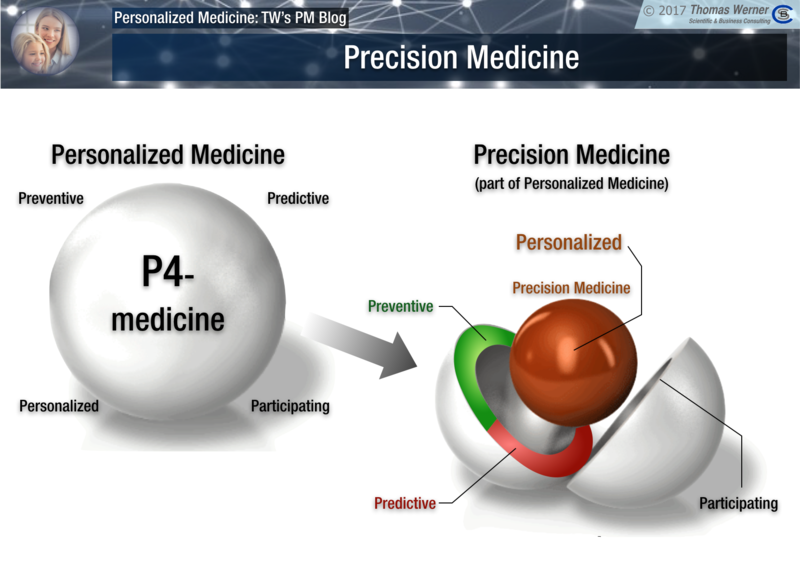 There is some confusion of the terms “Personalized Medicine” and “Precision Medicine”, which sometimes are (still) used interchangeably. This is not correct in my mind. 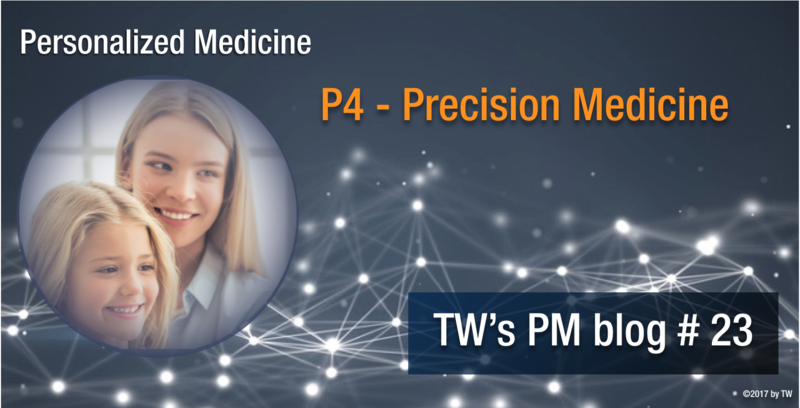 Let us start with the definition, which is currently on Wikipedia: Precision medicine (PM) is a medical model that proposes the customization of healthcare, with medical decisions, practices, or products being tailored to the individual patient. In this model, diagnostic testing is often employed for selecting appropriate and optimal therapies based on the context of a patient’s genetic content or other molecular or cellular analysis. Tools employed in precision medicine can include molecular diagnostics, imaging, and analytics. Precision Medicine refers to the tailoring of medical treatment to the individual characteristics of each patient. (…) Preventive or therapeutic interventions can then be concentrated on those who will benefit, sparing expense and side effects for those who will not. (…) Hence, the term in practice has so much overlap with "personalized medicine" that they are often used interchangeably. Although the preventive part is mentioned the focus clearly rest on diagnosis and therapy. Especially since Barack Obama announced in 2015 “The Precision Medicine Initiative” with $215 million in funding in the US, “Precision Medicine” has largely replaced the term “Personalized Medicine”. A PDF to that topic can be dowloaded for free at . I see Precision Medicine as the core component of Personalised Medicine as far as diagnosis and treatment of diseases are concerned. However, two important components of P4-medicine, Preventive and Participatory receive little more that lip-service in Precision Medicine. I regard these topics as far more important that personalized treatment regimes. It is like creating a more sophisticated repair shop for automobile accidents. I would rather focus on preventive treatment of the cars avoiding crashes rather than repairing them. Preventive measures have the proven potential to avoid or delay the onset of globally important diseases such as obesity, (consequential or independent) Diabetes, and the vast majority or acquired cardio-vascular diseases. Quantification of diagnosis and success of lifestyle changes by scientific wellness might be the magic tool required to finally make people not only listen to preventive advise but also to follow through of lifestyle changes. This would probably save many more lives that the best personalised treatment will ever manage to do. Improved treatments and all aspects of “Precision Medicine” are very important and diseased patient will benefit from all these developments, no doubt about that. If you have become a patient already this is your best shot in reversing things before it is too late. However, starting earlier and preventing young and healthy people from becoming patients in the first place makes much more sense for future generations than watching them slip into disease and then trying to rescue patient already afflicted and weakened by disease. For that reason I do not believe in interchangeability of the two terms “Precision Medicine” and “Personalised Medicine". Next week I come back to a topic already briefly mentioned: Patient stratification, which is a prerequisite for al of Personalized Medicine including all “Precision Medicine” approaches.